I always knew that as a Black man, I would experience some type of discrimination when applying for jobs. I anticipated that it would happen when a person saw the color of my skin, but I later learned that I didn’t have to be seen to be discriminated against. 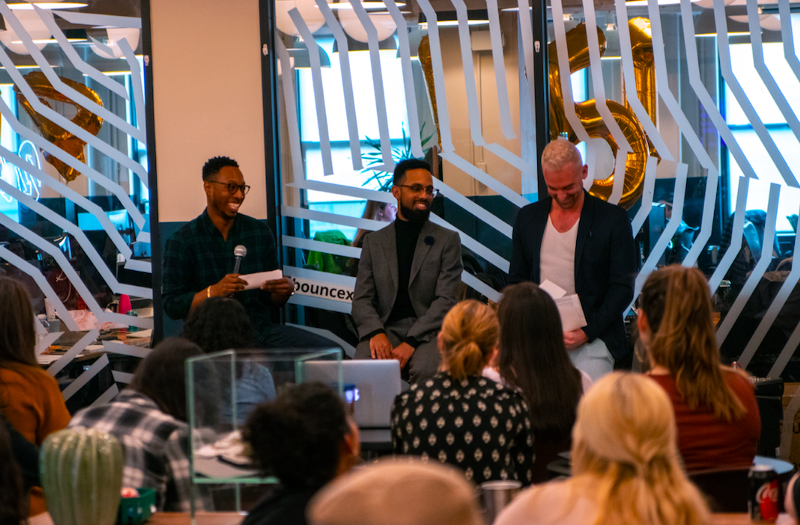 Terry (far left) discusses his experiences being black in tech at a BounceX panel. Apply to as many roles as I could in the same company so that they would have to see my resume. Make sure that I hit all the keywords in the job description. Reach out to people on LinkedIn and send them my resume directly. When those efforts still fell short, I became determined to identify what was standing in my way. So, I sent another application for a job that I’d already applied for. I used the same exact resume, but this time, I used my middle name rather than my first name. And about 3 weeks later, I got good news and bad news. Though in reality it was something that I’d known all my life, it was then that I truly realized that discrimination extends well beyond judging an individual based on his or her skin color. It can also include one’s name. Growing up in my community, I always felt that my name, Lakuan, was normal. In the back of my head, I feared that in the corporate world, it would be viewed with judgment. This experience with my resume only solidified that fear. I was forced to acknowledge that using my first name could close opportunities for me to even get an interview, let alone a job. I determined that maybe, for the sake of getting my foot in the door, I would have to go by Terry moving forward. When I reached out to friends and mentors for advice about this decision, I invariably got the same question in response: “Are you ashamed of your name?” No. I’m not. I love my name, and I admire that it’s unique. In fact, I’m protective of my name. My name is my identity. But I can’t deny the ignorance that exists in the world and the bias that permeates every level of our society, including the workplace. And as such, I often have to hide my true self. Some people have a word for my choice to use a more accepted name: code-switching. Code-switching is when people adapt their word choices and language-use based on the individuals around them. For me specifically, it means choosing to go as Terry in the workplace and as Lakuan in my personal life. Currently, I serve as the Diversity, Community and Inclusion Associate at BounceX. From my first day interviewing, I felt that BounceX wanted to get to know me, the real me. They accepted me as my true self no matter what that meant. BounceX is the first place I’ve felt like I can go as my first name at work if I want. And if that meant going as Lakuan or staying as Terry, it would be my choice. So, back to bad news and good news. Employers, the bad news is that many of your employees have been forced to hide their true selves to get where they are professionally, whether that means hiding their sexuality, gender identity or even their names. The good news is that your company can be the first place to change that for them. You can be the employer that not only accepts, but openly welcomes people for who they are, in all facets. Remove names from resumes to avoid bias. Switch from “Culture Fit” (Does this person fit the mold?) to “Culture Add” (Does this person add something to the team? Do they challenge me?). Create a Diversity and Inclusion team. Of course, there’s more to do than just these three things, but they all come back to creating a space that allows your employees to be their true selves. Support them, and everyone will thrive. Terry Smith is the Diversity & Inclusion Associate at BounceX. As a part of the D&I team, Terry manages the company’s Employee Resource Groups and helps promote a more inclusive workplace environment.